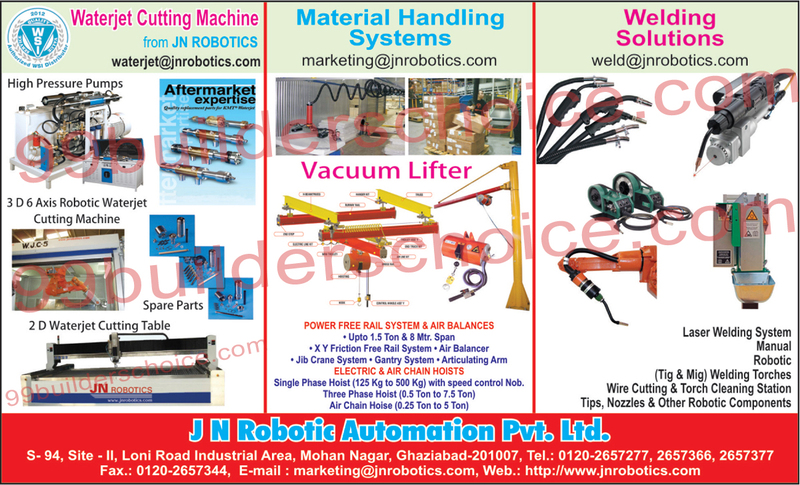 J N Robotic Automation Pvt. Ltd.
Waterjet Cutting Machines, Pressure Pumps, Robotic Water jet Cutting Machine, 2D Waterjet Cutting Machine, Manual Laser Welding Systems, Waterjet Cutting Machine Spare Parts, Material Handling Equipments, Vacuum Lifters, Power Free Rail Systems, Air Balances, Electric Chain Hoists, Air Chain Hoists, Robotic Laser Welding Systems, Tig Welding Torches, Mig Welding Torches, Wire Cutting Stations, Torch Cleaning Stations, Robotic Components, Welding Nozzles, Welding Tips,Laser Welding Systems, Wire Cutting System as an active Manufacturer, Supplier, Dealer, Distributor, Trader and Seller etc. (*Importer/Exporter/Service Provider).